A foot reflexology massage can be one of the most relaxing things you can do for yourself. According to Wikipedia, this ancient alternative healing method is traditionally done using tips of the fingers, thumbs or even foot to apply manual pressure to your skin. 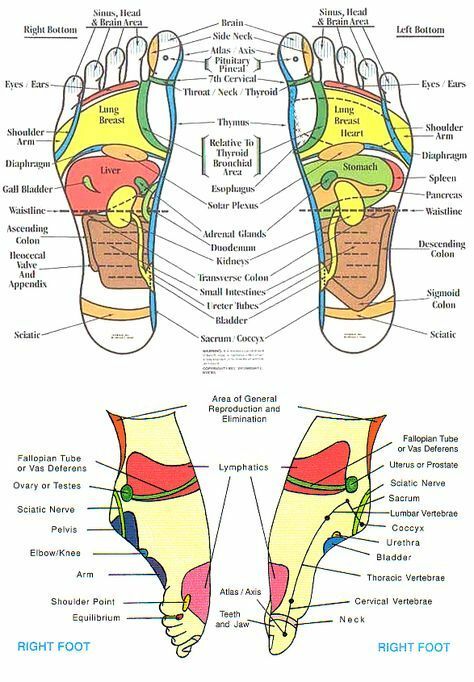 It is an approach based on triggering pressure points based on a Chinese foot reflexology chart (like what is shown below). When done accordingly, the concept is that it will activate pressure points associated with different parts of your body. This will eventually boost your ‘life force’, called Qi, which helps to generate a healing process. The general beneficial effects of reflexology involve relaxation of your nervous system through stimulating nerve endings in your feet. Also, increased blood flow to the whole body helps to mobilize healing as well as calming your system. This could result in a night of restful sleep, a revived vigor and health. Conventionally, you need the help of a professional massage therapist to do reflexology. But with the advent of technology, it’s good to know that there are numerous machines out there that imitates the feeling and still achieve the benefits! Our feet massager, Shiatsu Foot and Leg Massager is a great and easy-to-use at home equipment. It provides you with three awesome kneading massage program and three vibration/intensity modes, so you can choose the type of message you want. For reflexology demonstration using the machine, watch our youtube video where John explain how to use the Shiatsu Foot and Leg Massager. Also, see more charts on our Happy Feet Pinterest board!